iQ Drive® | Tappan Tech3 97% AFUE Modulating Gas Furnace,Excellent Home Comfort: Members of the i Q Drive family reach ultra-high levels of efficiency. This furnace is no exception. This unit analyzes the temperature of your home and adjusts firing percentage accordingly. It can adjust between 50% and 100% with the gas valve, and down to 15% with a time proportioning thermostat.Promotes Ultra-Quiet Operation: The motor in this unit is encased in an insulated cabinet for ultimate sound reduction. In addition, the motor is exceptionally quiet – it ramps up to speed instead of performing abrupt on/off cycles.ENERGY STAR Heating: This unit's high-efficiency performance means that it qualifies as a high-efficiency, ENERGY STAR rated product (in certain sizes and matches).iQ Drive Programmable Controller: This gas furnace utilizes the Tappan iQ Drive controller to give you complete control over your indoor environment, including maintenance reminders, programmable comfort schedules and troubleshooting diagnostics . i SEER: The i SEER technology in this gas furnace can maximize the cooling efficiency of your 13- or 14-SEER cooling system .iQ Drive Match: This furnace can be paired with one of our iQ Drive air conditioners or heat pumps for ultimate efficiency and premium comfort.Green Heating Performance: For additional energy savings and green performance, choose this ecoLogic® rated furnace. ecoLogic products are at the pinnacle of efficiency and home comfort.Quality Checked at Factory: Before this Tappan gas furnace leaves the factory it is checked 234 times for quality. The Tappan FG7MQ series of fully modulating gas furnaces offers exceptional heating efficient and premium home comfort. When you match this furnace with an i Q Drive air conditioner or heat pump, you can achieve maximum efficiency levels and may see significant savings on your utility costs. Ask your contractor if an iQ Drive system is right for your heating and cooling needs. Two Stages and Variable Speed: For exceptional comfort and reduced sound levels this unit operates in two stages and contains a variable-speed motor. Cooling Efficiency Maximized: Pair this gas furnace, with iSEER® technology, with your 13- or 14-SEER cooling system for maximum cooling efficiency potential. Energy-Saving Heating Performance: This gas furnace model is ENERGY STAR rated for efficiency (in certain sizes and matches). Insulation for Quiet Operation: A fully insulated blower compartment contributes to ultra-quiet operation. Ultimate Comfort: A 30-second blower delay assures a warm duct temperature at furnace startup – no cold blasts of air. Exceptional Igniter Technology: A SmartLite® control board helps extend the life of your igniter by learning the startup characteristics of your unit and adjusting firing percentage accordingly. Quality Check Process: Each Tappan gas furnace is manufactured with quality in mind. That is why we check each unit 234 times before it is shipped. The Tappan FG7TC-VS and FG7TL-VS gas furnaces offer efficiency, comfort and performance. You can pair this model with one of our iQ Drive cooling systems for ultimate comfort and efficiency. Plus, with the varialbe-speed motor and two-stage operation, you can enjoy additional home comfort. Ask your contractor if this is the right system for you. Two Stages for Extra Comfort: You can enjoy an exceptionally comfortable home with this gas furnace due to the two-stage gas valve. iSEER® for a Cooling Boost: Maximum cooling efficiency for your standard-efficiency air conditioner or heat pump can be achieved with this gas furnace due to its iSEER® technology. Exceptionally Quiet: Includes an insulated blower compartment for ultra-quiet operation. High-Efficiency Gas Heating: This gas furnace meets ENERGY STAR's benchmarks for high-efficiency heating equipment (in certain sizes and matches). Comfort at Startup: When your unit kicks on, you won’t be greeted by a blast of cold air. This furnace includes a 30-second blower delay for a warm duct temperature at startup. Reliable Igniter: The innovative SmartLite® technology in this furnace can help extend the life of your igniter. It learns the startup characteristics of your unit and adjusts firing percentage accordingly. Thorough Quality Check Process: We build our units with the highest quality standards in mind. This unit is checked 234 times before it is shipped from the factory. 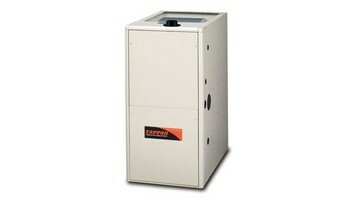 The Tappan series of FG7TC and FG7TL gas furnaces delivers energy-saving performance and whole-home comfort. The two-stage gas valve can provide additional comfort and 95.1% AFUE heating can help you cut back on utility costs. Ask your contractor if this is the right unit for your home.